In this post we will learn to fetch image from a database. I have taken Northwind database as an example. Employee table of the Notrhwind database stores a Photo using the Image type. We will fetch data from the Photo column (type: Image) in the MVC application. Let us start with the Controller. In the Index action all the Employees are fetched using the EmployeeRepository. Note: I am using repository pattern and the Entity framework. However you can fetch data directly using the Entity framework without the repository pattern. 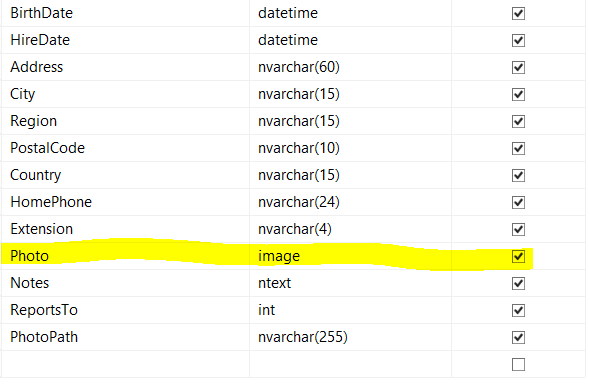 In the View, you should convert fetched photo in a byte array as shown below. For normal photo you don’t need to subtract 78 from the length. However OLE photos it is required. In above code snippet manually we are creating Memory Stream and then converting that to byte array. However in MVC library is available to do this task for you. You should able to view fetched images in the application. Happy coding. You save my day !!! thanks a lot !!!! Thanks, man! I needed some help with the image datatype. You got me home. Appreciate your help!